Topic: Save the Barge "WESTMORELAND"
Re: Save the Barge "WESTMORELAND"
The Trust is still pressing on with renovation plans in some instances at their own expense . In order to help with the finances while wading through red tape please check out the link below and help out if you can.Thankyou. Just to keep you informed of progress. Westmoreland now have their own website. Just to update our forum members and appeal to your generosity. Westmoreland's hulk is now laying off in Lower Halstow creek on a swinging mooring . As is usual when trying to refurbish or bring some piece of history back to life, money is the key. Unfortunately, in order to obtain grants etc., a certain amount of funds must be raised by the renovators. In the case of Westmoreland there are only 8 days left to reach the target figure of £2000 to enable the procedure to progress. I don`t fully understand the politics but basically, no grant money unless target figure is achieved. Thanks JW. We just have to hope now that the Parish Council won`t try and impose impossible limiting conditions and delays etc. on the project to hold it up or stop it. They say they don't have personal agendas but time will tell. They couldn't have been more devoted in there initial opposition which caused the demand for a poll in the end so I don't suppose their attitude will change. I notice that Ernie Tress (probably the only Halstow born and bred villager on the Council) left the council in October! Excellent news - good luck to all involved. Finally, after delaying tactics, the poll vote to decide the fate of the Westmorelands future at Lower Halstow is in . Makes one wonder who the parish councillors were representing with all there steadfast aim to stop the project . It certainly wasn`t the majority of their parishioners! Quote from her Facebook page. After an eternal wait - the results of the poll are in! There was a 53% turnout out of 913 potential voters. 340 people voted in favour. Delighted to announce that the large majority of the village wish to protect Lower Halstow's heritage and see the Westmoreland return to her home port to be restored. The parish council will now have a meeting to discuss the planning and licencing restrictions on the restoration. Here's hoping they get right behind the project and all villagers can work together to get this famous barge up and running again. Updates will be posted as the project should move rapidly along now. Lots of flimflam. Basically, nimby reasons by the councillors, only one of which is a true villager, not a newcomer from the village expansion. Can't say too much about the real reason! will Pm you . What reason for refusal are the Parish council giving grandarog? Thankyou all for reading this Westmoreland post. There is still a problem getting the Parish Council to reconsider their decision. I am pleading for all of our forum members that care about saving our heritage to please either Write or E-Mail Lower Halstow Parish Council pledging support for the Westmoreland to be restored in the village Barge Dock. The outcome whether she is saved or lost forever depends on the public support to overturn the Parish Coucils refusal decision. Swale Council dont have a problem, it is only the PC that is blocking progress. Restoration will begin as soon as the Westmoreland is towed into the dock. I have put the picture taken this morning of the Barge "Edith May"fully rigged and waiting for the rising tide to sail to Rochester for the Sweeps Festival this weekend. The same team that restored her to such a lovely seaworthy and operational condition are chomping at the bit to get started on restoring "Westmoreland" to the same high standard. Just imagine in a few years time when they are both sailing from the village dock. If we dont act now it may never happen. 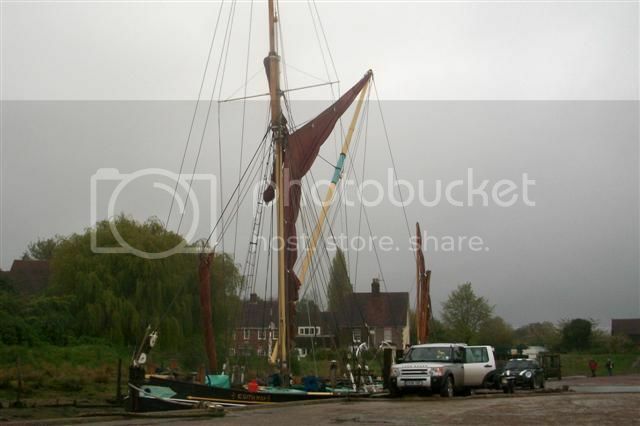 So please, please ,take 5 mins to fire off a letter or E-Mail..
“Westmoreland’ is a Spritsail rigged Thames Sailing Barge. She was built in 1900 by Alfred Marconi White at Conyer. She is now the only surviving Kent Brick Barge of her type. Owned by Eastwoods Brick makers her working life was spent based and trading from Lower Halstow dock. She is so much associated with the parish that she figures on the Parish Sign. Unfortunately, 40 years ago Barge trading gave way to road and rail transport so she became redundant. These last years have not been very good for her. Not only did she suffer a disastrous accident while moored at Hoo, when she broke in two, she has spent most of the last years deteriorating on the mud. Luckily Colin Frake purchased her and completed some repairs at Standard Quay, Faversham to stave off her demise. With the fast development of Standard quay into a Yuppee paradise an old kent barge in need of repair is considered an eyesore so she had to by moved. Temporarily she is housed in a Lighter at Otterham with no permanent berth for restoration. Geoff who restored and owns the Barge “Edith May” hoped to bring the Westmoreland back to her old home at Lower Halstow Dock for restoration. They had restored and operate the Edith May there . However despite overwhelming support from the local villagers and the Mayor of Swale at a public meeting ,the Lower Halstow Parish Councillors (who are supposedly elected to represent the people of the village) voted “unanimously” against the proposal strangely changing from a split vote at an earlier meeting!. I am hoping that most of our forum members are like minded with me and wish to preserve as much of our local heritage as possible. If the Parish Council dictorial decision is not overturned by public protest the Westmoreland will probably be lost forever. I have put links below, where you can read about Westmoreland and this project in more detail . If you care as much as I do that this project to save a unique sailing barge can get underway in the Dock that was her home for 60 years please post your supporting comments on the sites.